A faithful retelling of Charlotte Brontë's classic story of the love between the governess Jane Eyre and her master Mr Rochester, and the chilling secret set to tear them both apart. This is a brilliant book and I would recommend it to boys and girls aged nine to fourteen years old. I'm 12 and I don't like reading classics but this book was different I LOVED IT! This book was so awesome it had love, betrayal and a really good author! All you Mom's out there whose kids say "Classics are to hard to understand" or "I don't have time to read a huge book like that!" then put this on their lap and tell them that you want them to read it they will because once you start reading this book you won't be able to stop. A thrilling retelling that I'd consider one of the best novellas or novels I've ever read. It enlightened me about the real meaning of true love through the spark between Rochester and Jane besides other interesting anecdotes which enriched the story line, that I enjoyed very much. In fact, I've made Jane Eyre my spiritual role model. A really wonderful retelling that truly captures the awfulness of Lowood and Jane's aunt and cousins, her struggle for acceptance in a brutal world, and most importantly, the romantic spark between Rochester and Jane. Ten out of ten. Introducing my 11 year old daughter to the beauty of the written classic was not easy. 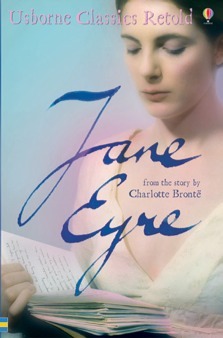 So a big thank you to Usborne for their translation of Jane Eyre. It has been wonderfully adapted without loosing the essence that makes Charlotte Bronte's stories so memorable. Is it a first that an 11 year old now looks forward to reading Wuthering Heights? Jane Eyre was a mind gripping story with romance, sadness and spookiness. It was beautifully retold but not in a way to spoil it. I loved the adjectives like grimace and anticipation. I read this book in two days and I could not put it down. My heart thumped on spooky parts and you would never have guessed the secrets of the book until the very end. If I had to rate the story I would give it ten out of ten for it was one of the best books I've read.